Struggling with drug and alcohol addiction can sometimes lead an individual down a destructive path that has legal consequences. Court-ordered rehab can reduce crime rates, improve the chances of recovery, and decrease unemployment rates. Court-ordered drug and alcohol rehabilitation may be the only hope for some people struggling with substance abuse. In fact, 60 to 80 percent of addicted offenders drop out of rehabilitation prematurely unless supervised by a court. There is a strong association between substance abuse and crime. Approximately 80 percent of offenders abuse alcohol or drugs, according to the National Association of Drug Court Professionals, and half of all inmates are clinically addicted. Six out of ten people arrested for most types of crimes test positive for illegal drugs at the time of their arrest. If you are wondering how to get someone into a court-ordered rehab program, know that there are many options available. While they may resent you at the time, getting someone the treatment they need to recover from addiction could potentially save his or her life. Court-ordered drug and alcohol rehabilitation is an option that may be given to a defendant of a drug- or alcohol-related crime instead of going to jail. It is a viable alternative when the judge and prosecution believe the defendant would benefit from rehabilitation. 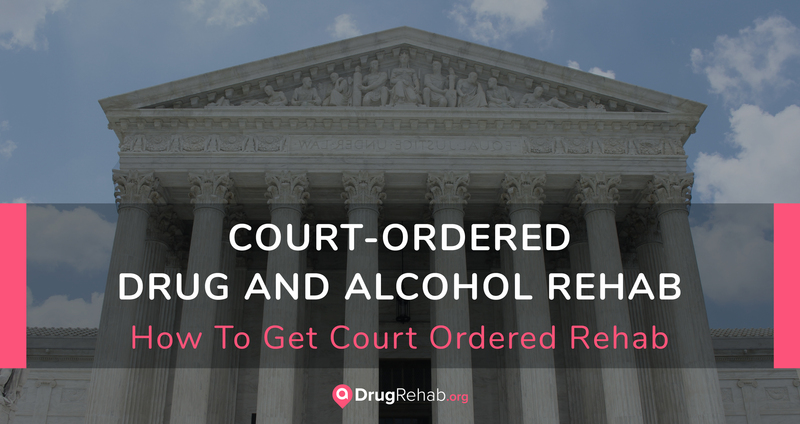 As the name implies, court-ordered drug and alcohol rehab is a mandatory sentence ordered by a judge as part of an official court ruling. Court-ordered rehabilitation is typically given as a sentence in lieu of prison time resulting from a crime committed when the individual was under the influence of drugs or alcohol. In many instances, rehabilitating defendants is more beneficial to the community than putting them in jail. A few months of rehabilitation costs less than years of imprisonment. Court-ordered drug and alcohol rehabilitation could reduce crime by getting habitual criminals the substance abuse help they need. Addiction treatment helps people get back to their normal lives and back to work, which benefits the community as a whole. According to the National Institute of Justice, there are more than 3,000 drug courts in the country as of 2005. Drug courts are designed to help individuals struggling with substance abuse and mental health disorders stay out of the justice system and lead meaningful and substance-free lives. Rather than offering punishment for a substance use disorder that has led an individual to legal consequences, drug courts offer programs to provide the individual with treatment for addiction. Drug courts are run by a variety of professionals that view addiction not as a moral failing but as a disease. These professionals may include defense attorneys, prosecutors, social workers, and specialized judges, and they help individuals achieve success both in recovery as well as in completing legal and societal obligations as part of their court-ordered sentencing. Drug courts are often part of a criminal sentence and may provide the option to complete treatment in lieu of jail time or offer programs to help integrate a person back into society after a prison sentence. Court-ordered rehab is often a component of a drug court program. There are many different types of court-ordered addiction treatment that a drug court can assign to an individual. The type of rehab center or program a person enters will depend on the extent of the convicted person’s crime as well as his or her level of addiction. The following are a few of the many programs that exist to help people achieve sobriety, remain sober, and become productive members of society. There are two different types of educational programs that are sometimes part of a court-ordered treatment plan: alcohol education programs and substance abuse education programs. Alcohol education programs are generally for people who have been charged with driving under the influence of alcohol, while substance abuse education is for those who have been charged with possession of drugs or drug paraphernalia. Both programs can be available in the form of a weeks-long educational course or drug rehab program. There may also be a community-service component to these programs. Those who have completed these types of programs in the past may not be eligible to do so again. Court-ordered inpatient drug and alcohol rehab is the most common form of treatment recommended for those struggling with a substance use disorder. This type of treatment requires the individual to reside at a residential treatment center for an extended period of time, often 30 days or longer. Court-ordered inpatient addiction treatment helps the individual discover the factors that led him or her to substance abuse, deal with the problems resulting from substance abuse, recognize situations that could lead to substance abuse in the future, and learn how to live a drug-free life. The crime committed was a direct or indirect result of dependence on or addiction to drugs or alcohol. The crime was violent or nonviolent. The defendant would benefit from rehabilitation. The defendant qualifies for a probation sentence. Group counseling may be required as part of a court-ordered drug and alcohol treatment program and is commonly part of programs provided by criminal justice organizations. Court-ordered group counseling is offered both inside and outside of prison as part of a probation period or required stay at a halfway house. Group counseling is provided by professionals and often requires the individual to attend counseling and 12-step meetings for a set number of hours or days each week. Relapse prevention groups may also be part of a court-ordered group counseling program. A community-based program is often used to help transition individuals back into their everyday lives. This type of program is especially common among those recently released from prison or upon completion of an inpatient drug and alcohol addiction treatment program or stay at a halfway house. Community-based programs can include a variety of treatment options, including regular group or individual counseling and other psychiatric services. The goal of community-based programs is to support those re-entering the community and ensure they maintain sobriety and lead a productive and meaningful life. Outpatient programs are drug and alcohol addiction treatment programs that don’t require the individual to reside at a treatment facility. Correctional facilities and justice systems often work with treatment centers to provide services to those in the criminal justice system. Outpatient programs are often recommended or court-ordered to individuals who don’t meet the requirements for inpatient treatment or have a shorter sentencing. Outpatient treatment can also be used to help an individual transition back into the community after jail time or an inpatient rehab program. Drug and alcohol rehab is typically effective whether or not a person goes willingly. In fact, being court-ordered to attend a rehab program can often change someone’s life for the better and keep them off the streets or in jail. Multiple studies have found that attending rehab due to legal pressure has led to increased attendance and better outcomes overall. However, the effectiveness of court-ordered rehab programs primarily lies in the hands of the person attending. If an individual is unwilling to change and accept a new way of life that is free from drugs and alcohol, rehab will likely be less effective for him or her. Luckily, staying out of jail or receiving a lesser sentence is usually enough motivation for someone to take court-ordered rehab seriously. This is especially true for those with children or other responsibilities that could be taken away if the individual does not successfully complete rehab. In most cases, court-ordered rehab is very effective at providing rehabilitation to those with a substance use disorder. It gives them a chance to stay out of the criminal justice system and lead a meaningful and fulfilling life. Many benefits result when a person attends court-ordered rehab. For one, it can keep an individual out of jail or prison and provide them with a means to leading a drug-free life. The benefits of court-ordered rehab will vary from person to person, but overall attending rehab has significant positive effects on an individual’s quality of life. What Are The Consequences Of Refusing Court-Ordered Drug Or Alcohol Rehab? Because attending court-ordered rehab is often in lieu of spending time in jail, refusing or skipping out on rehab can have severe consequences. Not completing court-ordered drug or alcohol rehab often means that the individual will face fines or jail or prison time. Court-ordered rehab is typically an option given to those who are first-time or non-violent offenders. Rehab is still a sentence handed down by a judge, and as such must be completed for the length of time and time -frame given. If an individual does not complete court-ordered rehab as instructed, he or she will be required to go through the court system once more and receive sentencing, which will often not be as lenient and understanding. Although you must be sentenced by a drug court or the justice system to attend a court-ordered rehab program, the individual attending rehab is still responsible for paying for treatment. Luckily, many court-ordered rehab centers accept public or private insurance. Having health insurance will likely make it easier to obtain sufficient coverage for drug and alcohol addiction treatment that complies with your sentence. If you don’t have insurance, there are still many options available to get assistance with paying for court-ordered rehab. The cost of rehab should never be what holds you back from seeking the drug and alcohol addiction treatment you need and deserve. Court-ordered rehab programs can provide many benefits to both the offender and the society as a whole. Increased productivity, lowered crime rates, and decreased health care costs are just a few of the many benefits that society experiences from effective court-ordered treatment programs. Individuals who successfully complete court-ordered rehab have reported increased happiness and wellbeing, improved health, and a significant increase in job retention. Contact us to learn more about court-ordered drug rehab treatment and available options today.